Is it wrong to find so much enjoyment in someone else’s pain? 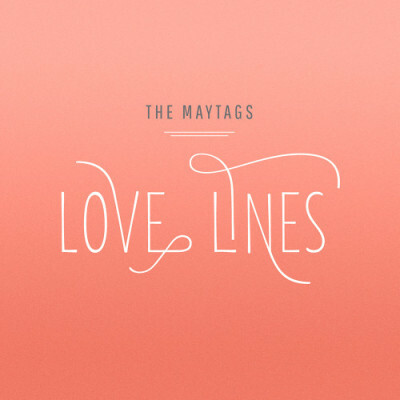 It’s honestly a bit of an unfortunate tragedy that the core of The Maytags’ debut full length, Love Lines, (out today, independently) is devoted to deconstructing and narrating the process of a painful breakup, because, from a purely music point of view, this seven piece band from Des Moines, Iowa has a stunning piece of work on their hands. Love Lines is hardly a work assembled from an outpouring of casual folly or happenstance musical decisions. Dustin Smith (vocals, guitar), Nick Leo (keys), Sam Mogerman (drums), Daniel Kreipke (bass), Andy Poppen (trumpet, vocals, Tim Sanders (saxophone, vocals), and Ben Chappell (lead guitar) have worked as a unit in the deepest sense of the term where band synchronicity is concerned and, with seven players each having to pull quite their fair share of instrumental weight, The Maytags’ efforts – to say nothing of the band itself – are the results of unwavering dedication and participation. Living life between the days from the release of their debut EP, Nova (December 2014, independent), and the present, The Maytags have had plenty of time to thoughtfully compose the nine tracks of which Love Lines is comprised. The steady contemplation is overwhelmingly evident thanks to the way each player contributes to this soul and blues powered project. The Maytags haven’t loaded up on parts or people with an objective of aimless or blind volume. Nor is the inclusion of things like sax, and trumpet, applied through quick and dirty two-note cameos on each track. The album boasts a praise worthy level of skill with arrangement that extends well past only knowing what parts one wants to take the lead when. These musicians have solid performer’s chops that, for an independent debuting group, translate to an implication of sheer talent and musical dexterity. When paired with Dustin Smith’s controlled but ever-so-slightly raspy vocal, it becomes nearly impossible not to envision The Maytags playing together with the likes of Leon Bridges, Madison Ward & The Mama Bear, Benjamin Booker, or Alabama Shakes. Both the former and latter are unsurprising, as Andrija Tokic, who worked with each, was who the band chose to record Love Lines. Right from the first strums of clean toned electric guitar alongside thumping floor tom, starter track “Pushing Up Rivers” sets Love Lines’ decidedly throwback mood with some high pass filtering and a warmer sound comfortable in the analog space, all around. What is also immediately displayed however, is that The Maytags don’t want this experience to be left as “They’re a new band that is just doing everything an older way.” Peaks of more modernized refinement on elements like Smith’s vocals (especially for in the track “Street Clothes”) and an affinity for a well-defined and front-leading bass tone, makes any “newer” sounds come across like a beneficial, but not excessive accent, to the album’s otherwise very vintage framework. The band does well just playing with the contrast of basic sound shaping. Really, besides The Maytags self-sustained cohesion as a big band, the diamonds in Love Lines are found in a plethora of individual aspects: Compositional choices that make your ears perk up (e.g around the 3:05 mark of “Marry Ya,” a sax based breakdown that runs to the end creates dissonance on the leading tone to grab attention before resolving on the tonic. ); a far-too-fleeting moment of unexpected vocal bass (“Abused: Suite for Green Eyes”); multiple effortless, single-track rhythm changes (“Problems”); a spoken admittance in the bridge of “Call Me” (But I think I just need a moment / a moment to accept) that feels like a more off-the-cuff decision someone in Smith’s position might make at the mic during a long running live set and being one of a few ways he would change things up for that night. There are almost too many subtle sparkles to keep track. Then, what is perhaps the strongest case for indisputable praise and enjoyment on Love Lines, is the entirely instrumental title track, which is second in a three-part series each subtitled “Suite for Green Eyes.” Organ and minor intervals mixed with blue notes, accidentals, and a heap of changing rhythms let The Maytags really showcase not only their practical prowess but how their personalities come through their instruments, with no distractions throughout. The deception near the very end of this gem of a track, when it seems the piece will finish using a predictable move of holding out notes to resolve on the bottom of the pentatonic scale, instead opting for an abrupt about-face to ascend and close on unison octaves. It is clear there is no compromise toward convention from this band – even within lines of what would be completely understandable and acceptable for the confines of soul and blues. Apologies for the Schadenfreude. Listening to this album is just that fun. Love Lines is out independently today. Order a copy on vinyl, CD, or digitally through iTunes and Bandcamp. The band is currently out promoting the release, which includes a series of Iowa based shows, listed below.